US Customs and Border Protection close San Ysidro port of entry as Central American migrants try to breach the fence. US Customs and Border Protection on Sunday closed road and pedestrian bridges in both directions at the San Ysidro port of entry, one of the largest land border crossings between San Diego and Tijuana, Mexico, CNN reported. 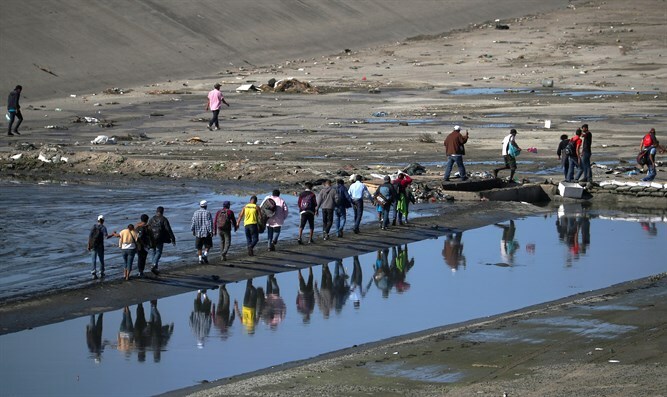 The closures came after some 500 migrants overwhelmed federal and local Mexican police blockades and rushed toward the US border near Tijuana, Mexico. The crowds are made up of men, women and a lot of children, according to CNN. The Associated Press reported that the migrants were enveloped with tear gas after a few tried to breach the fence. US agents shot the gas, according to an AP reporter on the scene. Children were screaming and coughing in the mayhem. On the US side of the fence, shoppers streamed in and out of an outlet mall. "The additional personnel, which included CBP officers, US Border Patrol agents, and Air and Marine agents, were recently deployed to the San Diego area from various areas around the country in preparation for the potential arrival of the caravan in Tijuana." The border incidents come a day after US President Donald Trump reiterated that he would not allow migrants to enter through the border with Mexico until their claims are examined by a court. "There is no agreement of any sort between the incoming Mexican government and the US government," future Interior Minister Olga Sanchez said in a statement quoted by AP. Trump took to Twitter again Sunday to express his displeasure with the caravans in Mexico.